Global organizations such as Skype, Amazon, Rakuten have chosen Luxembourg. Luxembourg government policies are dedicated to the support of ICT activities. Luxembourg, the hottest location for media and ICT activities. RTL Group, Europe’s leading broadcaster, and SES, the world’s pre-eminent satellite operator, are headquartered in Luxembourg. Low price, green and stable electricity are some of the key factors in the success of the Luxembourg data center ecosystem. The cost of electrical energy is one of the most important factors in global operational costs. Over the last few years, Luxembourg has invested heavily in order to improve the energy efficiency of its data centers. The electrical energy price for industrial customers is very low in Luxembourg. Luxembourg is connected to the European grid via fully independent and redundant circuits, each of them capable of assuming the entire electricity needs of the whole country. 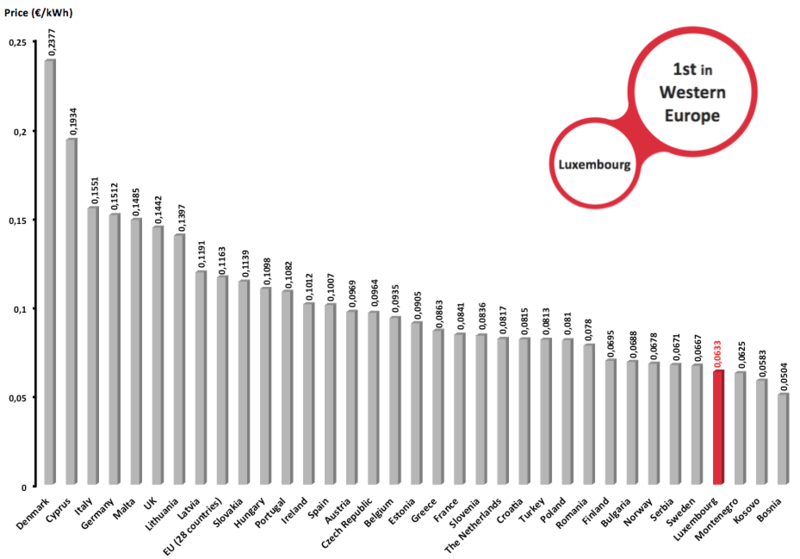 Luxembourg is the European Union’s number 1 in a comparison indicating the average annual power outage time for clients connected to the power grid. Continuous investment has been made in order to ensure Luxembourg has a modern infrastructure with a focus on network stability, resulting in virtually no service interruptions for many years. Luxembourg's ideal geographical situation has allowed the country to build an international fiber network, becoming an ultra-low latency hub in Europe, with average round-trip times of around 5 milliseconds to the other major European Internet hubs such as London, Amsterdam, Frankfurt and Paris. 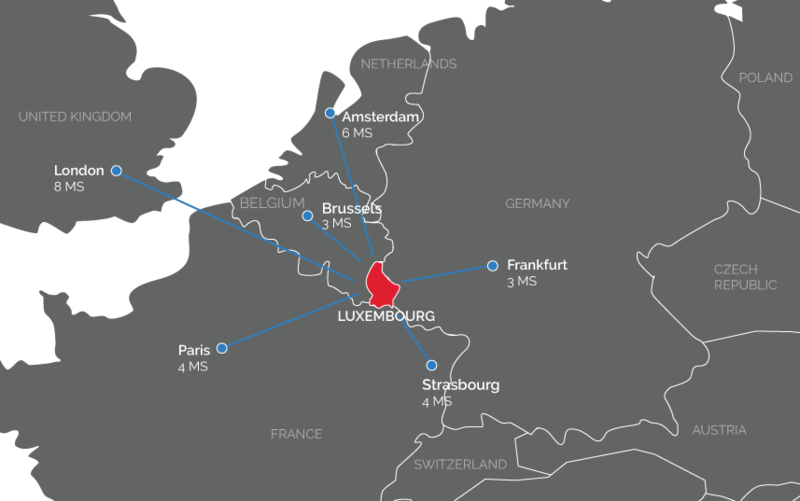 Luxembourg also has direct links with major neighboring Internet exchanges such as AMS-IX, LINX, France-IX and DE-CIX. The Uptime Institute, an organization whose aim is to improve the efficiency and reliability of data centers around the world, has created a 4 category classification system, from Tier I to Tier IV (Tier IV being the highest level of reliability). According to your planned activity and your budget, you can choose the data center with the right classification for you. In Luxembourg, you will find data centers across all Tier certifications, allowing you to make the best decision for your business. ICT has been part of the Luxembourg economy for over 80 years going back to the historic media company RTL, founded in the 1930s, and SES (Europe’s first privately owned satellite company) created in the 1980s. In light of ICT’s growing role in the global economy, successive Luxembourg governments have actively supported the development of this sector in order to become a center of excellence for ICT and a key data hub in Europe. State-of-the-art infrastructure has been developed to attract businesses to Luxembourg and other measures have been taken to promote the country as a European Trusted Information Center. In 2014, the government presented its ‘Digital Lëtzebuerg‘ initiative aimed at strengthening and consolidating its long-term position in the ICT field. This initiative focuses on ICT as an economic sector, and ICT as a business enabler, and comprises a series of work-streams looking at different aspects of the sector.